Earlier this year, I set a goal to start cooking at home more — and branch out from my usual pasta and pesto dinner. 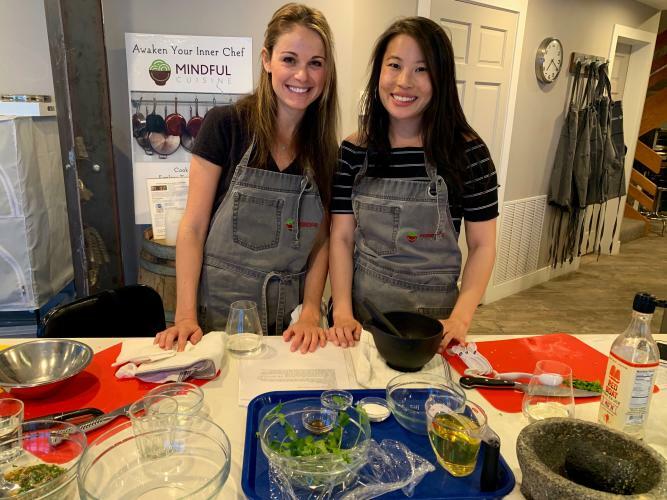 When I saw a Thai cooking class offered by Mindful Cuisine, a cooking and dining experience in Park City, I immediately signed up. I’m a huge fan of Thai food, although I’ll be honest: the idea of cooking the cuisine at home was daunting. But I figured that if I could learn how to prepare a Thai-inspired dinner at home, I could whip up just about anything. 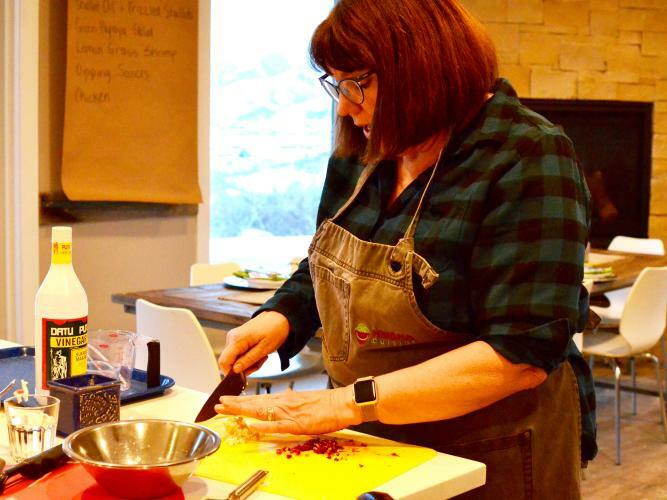 What: Mindful Cuisine, an interactive cooking and dining experience in Park City. When: Classes are hosted almost every weekend — check out the calendar here. Or you can book a private event. How: Call (949) 328-7131, email cheflinda@mindfulcuisine.com, or sign up online to register for a class. 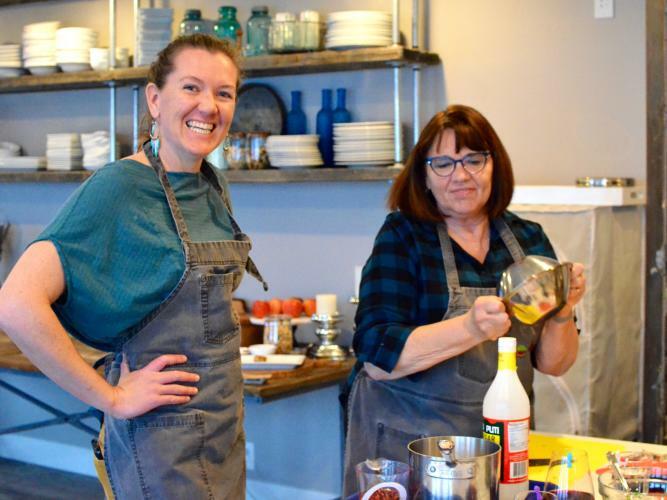 Mindful Cuisine is owned by Chef Linda Elbert and her husband, Larry. Growing up as an only child of parents who loved to cook and entertain, Linda discovered her passion for food early in life. But for a long time, she didn’t even consider cooking professionally. Instead, she completed a Ph.D. in Clinical Psychology and worked in private practice with children and adults. Although she loved her career in psychology, after her children were grown, Linda had more free time on her hands. She decided to attend the local professional culinary school in Laguna Beach, where she lived prior to moving to Park City. She also attended a vegan culinary school and a wine program. Ever since her love of food has blossomed into a busy second career. In the summer, guests are able to see the plants Linda grows in her backyard, as well as the chicken coop. Since it was the end of (a very snowy) winter when we attended, we could only imagine how beautiful the backyard must be in the growing season. The “Thai Tonight” menu included lemongrass shrimp as an appetizer, Chiang Mai roast chicken with three dipping sauces, green papaya salad, sauteed snap peas, and oyster mushrooms, and sticky rice with mango for dessert. And we’d be cooking it all ourselves. Chef Linda had printed off the recipes we’d be making, and although they sounded complex, she broke them down into very doable directions — and luckily, helped guide us every step of the way, too. Each of the guests was assigned a task. While I peeled the green papaya for the salad, my friend blended garlic, Thai chiles, kosher salt, sugar, lime juice, fish sauce, and cilantro together for the chile-lime sauce. 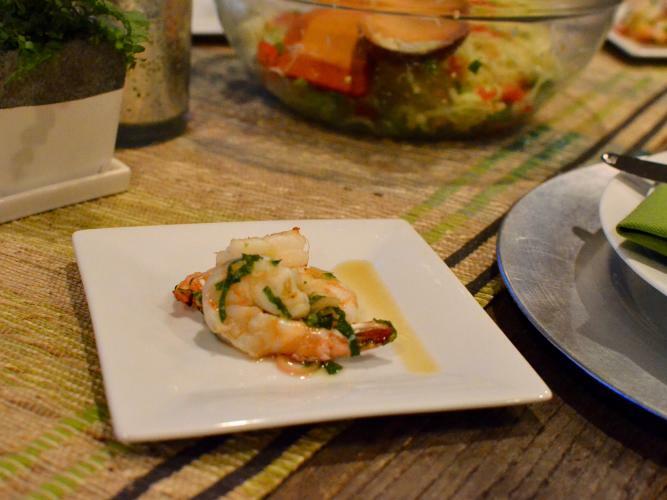 While Larry manned the grill where the chickens were cooking, another couple worked on the lemongrass shrimp. Chef Linda also demonstrated how to sauté mushrooms in a healthier way, without all the extra butter and oil that often gets added. The trick is to add about 1/4 cup of water when you add the mushrooms to your sauté pan. The mushrooms will release their own juices, and the water will look like it’s getting deeper, but then suddenly it’ll all evaporate and you’re left with nicely cooked mushrooms — no extra fat needed. Finally, it was time to taste our homemade Thai meal. Each dish was delicious in its own way and had unique tastes that proved the wide range of tastes that Thai food offers. 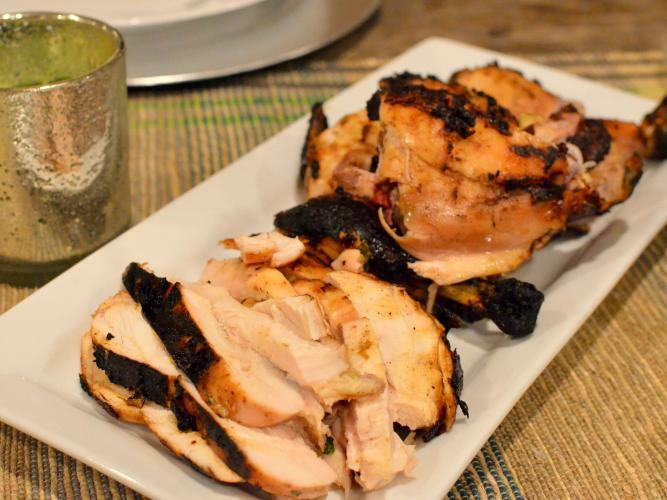 The chicken was moist and flavorful, while each of the dipping sauces served as the perfect complement. I loved how we not only gained new skills but also confidence in the kitchen. I never thought I’d be able to recreate a sweet chili dipping sauce or mango sticky rice at home, but under Chef Linda’s guidance, it was much simpler than I’d ever expected it to be. I know I’ll be making a few of these dishes many times again in the future. Perhaps the best part of the evening was sitting around the dinner table and getting to know Linda and Larry, along with the other guests. At the beginning of the night, we were strangers who’d never met; but by the end, it was like we were old friends.